Pain on the back, sides, even front of the neck. Pain in these areas can extend down into the tops of the shoulders or back, can radiate up into the back of the head around the ear, jaw, or even to the temple and eye. Due to where the various neck muscles attach and where their pain radiates, all of theses areas can be involved in “neck pain”. Muscular pain (most common). Muscles overused -> get stuck tight -> tug on the things they’re attached to -> feelings of tension and pain, may have the feeling that the area is tight but you don’t know how to relax it. Migraines - many people who suffer from migraines have tight neck muscles and describe the feeling of the migraine attack as beginning on the shoulders, neck or where the neck and head meet, then spreading to other parts of the head. Although migraines are a more complex issue, addressing the neck may help to minimize some migraines. Nerve pain - nerve impingement or damage affecting the neck area. Bone involvement - neck bones out of alignment, causing pain in the muscles and/or nerves around them. Inflammation (arthritis in the joints of neck) - irritating the surrounding bones, nerves, muscles. GOOD POSTURE - Our skeletons are designed to support most of the weight of our body. Having good posture and alignment goes a long way towards relieving neck pain. Balancing your body on your skeletal system properly helps to reduce the strain on your muscles, which typically have to compensate when you’re in an unnatural position. STRETCHING - Most of us don’t stretch or move nearly as much as our bodies need to. You can even do some of these simple exercises while standing in line, at your desk at work, or while watching TV. Stretching helps to strengthen your muscles, which helps keep your bones in place, making alignment a little easier. LEANING STRETCHES: Gently lean your head to one side as far as it will go, and then stretch the other side. Do a similar motion leaning forward, and then backwards. You can interlace your fingers on the back of your head to help add a little gentle pressure when leaning forward. To give yourself a bit more of a workout and help build up your neck muscles, lay flat on your back on your bed with your head hanging over a side and do the same exercises. BOBBLE STRETCHES: Stand and let your body hang loose, then gently bounce with your knees while gently leaning your head to one side as far as it will go, and then stretching the other side while “bobbling” your head. The natural pull of gravity will help to stretch your muscles more than just doing it yourself. TIGHTEN AND RELEASE: Tighten your shoulders as much as you can while raising them up towards your ears. Hold that position for a short while, then in a quick motion, bring your shoulders down and breathe out. Hands can just hang loose. ARM CIRCLES: Your arms can be straight out, or just hanging loosely at your side. Use forward and backwards motions. 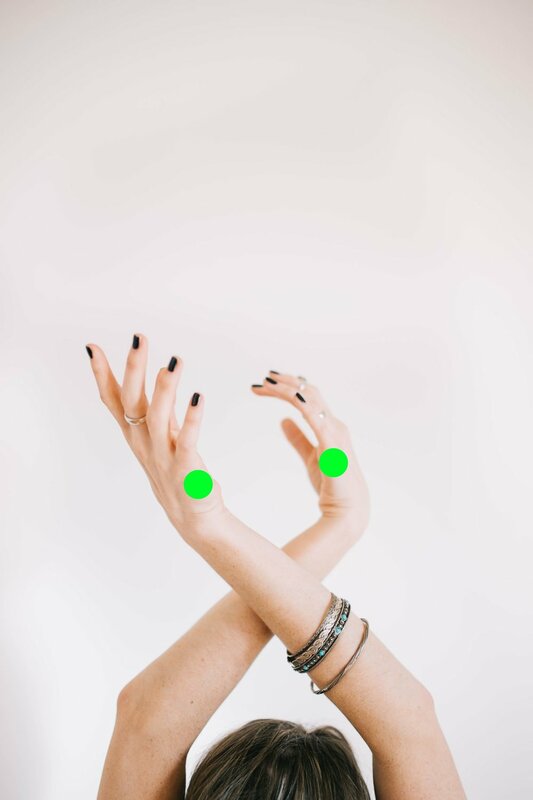 You can find this acupressure point by taking your index and third fingers on both hands at the base of your skull where it connects with the neck. Then gently slide your fingers in opposite directions until they pass over a vertical muscle on each side of the spine. Gently press and massage the Gall Bladder 20 point. You can let your head drop back some while doing this as well. muscle about mid-way in between your neck and where the arm connects to the shoulder. You can lean your head to one side while gently pressing and massaging the Gall Bladder 21 point, and then switch sides. This is a good place to really dig into the muscles. Note: do not use during pregnancy . 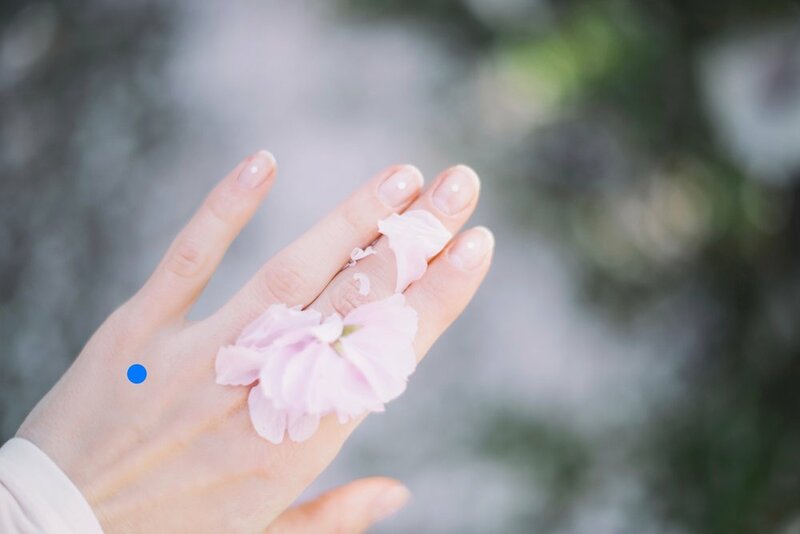 Follow the outer side of your hand down the pinky, just past the last knuckle and press in “under the bump.” Often the palmistry heart line in the hand will end here too. Press and massage on both hands. Triple Heater 3 is located in between the bones of the 4th finger and pinky on the hand. Bladder 67 (green): This is at the end of the pinky toe. Gall Bladder 41 (red): Start with your finger in between your 4th toe and pinky toe, then slide back until you pass over a tendon. This is the Gall Bladder 41 point. Bladder 60 (green): Start at the top of the ankle bone, and slide your finger back until you feel a small pocket. Bladder 62 (blue): This point is just below the ankle bone. You can also massage the outer edge of the whole foot. Heat applied to a tight area can help increase the circulation, dilate the blood vessels, and help to loosen up the muscles and relax tight areas. Cold generally constricts tight areas and doesn’t help, unless the pain is severe and it’s used temporarily to help numb the pain. PROFESSIONAL HELP: When the above methods aren’t enough, seek the help of professional services, like massage/Shiatsu therapy, chiropractic care, cranial-sacral release, or acupuncture. SHARE YOUR THOUGHTS: Please share your thoughts and learnings with us via email or through our holistic Wellness Facebook group.